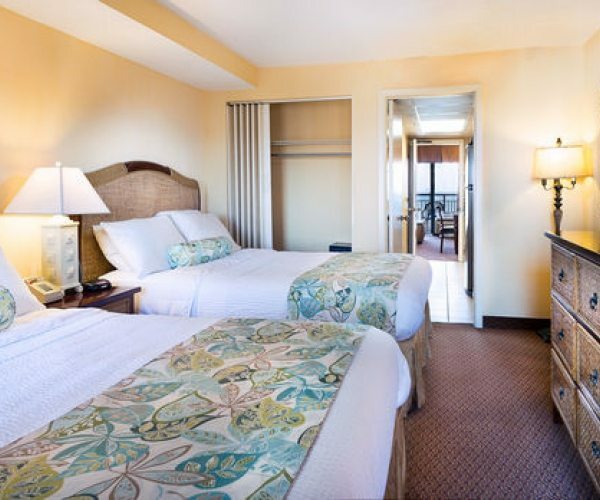 This oceanfront suite features 2 queen beds, living room with a murphy bed, sofa, dining area, kitchen, bathroom, and private balcony. This oceanfront suite features 2 queen beds, living room with a murphy bed, sofa, dining area, kitchen, bathroom, and private balcony. These rooms start on the 3rd floor and go up to the 16th floor. The rooms are 506sq feet. All suites and balconies are non-smoking. Free Full Hot Deluxe Breakfast Every Morning.